Boston Marathon Anniversary in Roxbury from Pavement Pieces on Vimeo. In the aftermath of the Boston Marathon bombing, information about the Tsarnaev brothers began to surface, remnants and clues rising out of a swamp of grief. Of Chechen heritage, the family immigrated to the U.S. when the younger brother, Dzhokhar, was only 8-years- old. Now Dzhokhar Tsarnaev may face the death penalty for his participation in domestic terrorism. This year, Meb Keflezighi won the very same marathon, clocking in at two hours and eight minutes. He is also an immigrant, having come to the U.S. at age 12 as an Eritrean refugee. One year after the bombing, what can we say, if anything, about being a foreign-born and American-raised young person? That it can lead to both exceptional athleticism and terrible crimes only points to the complexity of the question. The day before the Boston Marathon, Jaelle Sanon, 17, sat on her couch in front of the TV, surrounded by textbooks and study aids for AP tests. A high school junior, she planned to use her spring break for studying, not attending the marathon. 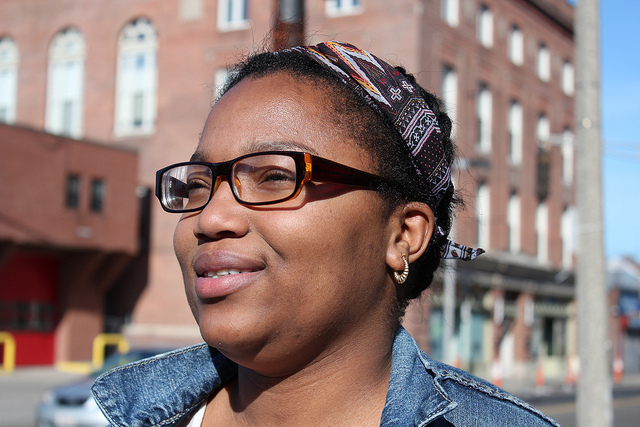 Originally born in Haiti, she sees the marathon as an example of unbalanced media coverage. Sanon lives in Roxbury, a part of Boston far removed from the magnolia-lined boulevards of Brookline, where the marathon course reaches the finish line. On April 17th 2013, two days after the bombing, a man was shot just blocks from Sanon’s home. Three days later, another man was shot, again less than a mile away. Both men died. In 2010, the poverty level in Roxbury was estimated at about 27 percent, over a third greater than the city average. The Tsarnaev brothers lived in Cambridge, a more affluent area. But despite this difference in neighborhood, Sanon shares other similarities with Dzhokhar Tsarnaev. Both arrived in the U.S. at 8, both had older siblings who struggled more with the adjustment. “Even though they were American and here, they still see innocent people dying every day in their home country,” said Sanon, speaking of the marathon bombers. She recognizes this disconnect between an immigrant child’s adopted country and the country of their birth. She speculates that this pain may have caused the bombing. “I’m not saying it’s right, but that might have been a reason,” she said. Boston, like other large U.S. cities, serves as a new home for many immigrants. The Boston Redevelopment Authority reports that in 2008, the city had the sixth largest proportion of foreign-born residents. Research suggests that the immigrant population in Boston is mainly composed of families. And among foreign-born residents, a full 35 percent are young adults. It is a demographic that Sanon will share with Tsarnaev when she turns 18 next year. But other young immigrants do not see a connection as easily. Suad Maow, 29, and born in Somalia, moved to the U.S. when she was seven. She now lives in Somerville, just to the north of Cambridge. Maow also recognized the one-track mind of last year’s marathon reporting. But unlike Sanon, she see this problem as a symptom of modern day news media. On the day of the marathon, both Sanon and Maow had other things to do. But Dawit Aynalem waded through crowds to reach security gates bordering the finish line. “I’m here to support my country, basically,” said Aynalem. 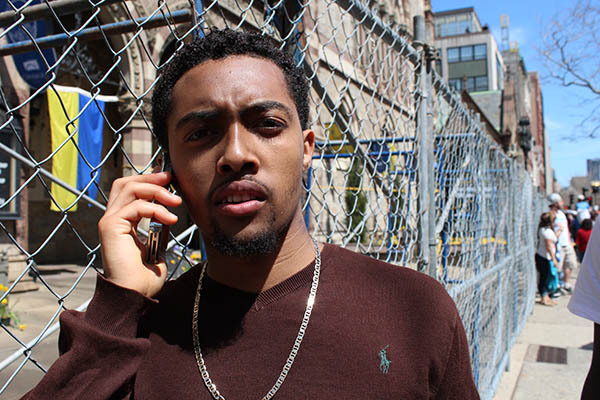 Born in Ethiopia, he moved to Boston when he was 12, almost eight years ago. Untroubled by any worries about media coverage, the treatment of immigrants, or how people might see him, he held up his own marathon sign. 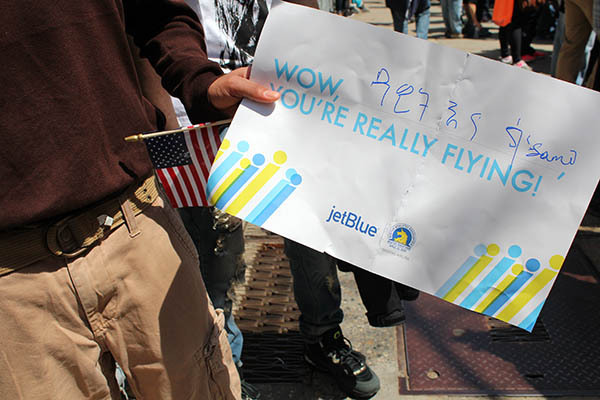 It was a JetBlue poster that read “Wow, You’re Really Flying,” above which he had inscribed his own message of support in the Ge’ez script of Ethiopia. He also held an American flag.